Miguel Diaz-Canel: Cuba, Long Led By Castros, Hails New President Outside Family : The Two-Way When Raúl Castro passed Miguel Mario Díaz-Canel Bermúdez the job, the Communist Party stalwart became Cuba's first president not named Castro in decades. But don't expect radical reforms. The man who now leads Cuba: Miguel Mario Díaz-Canel Bermúdez, 57. The Communist Party operative, seen here in Santa Clara last month, was elected president of the island nation Thursday. 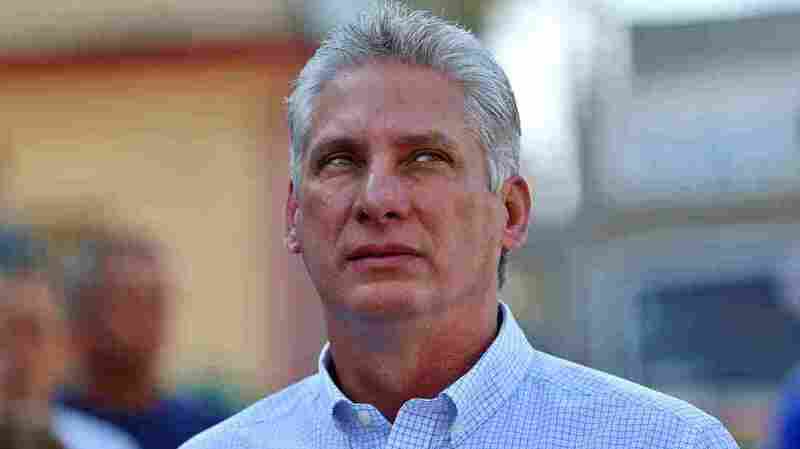 In fact, if there was any surprise at all, it might be that Díaz-Canel, the 57-year-old party stalwart long expected to succeed Castro, did not win every vote cast after the party nominated him its sole candidate Wednesday. Just 603 of 604 Cuban lawmakers voted for him in a secret ballot that night. After the result was announced Thursday, Díaz-Canel and Castro mounted the dais in front of the National Assembly and embraced in a gesture both real and deeply symbolic. "The people have given this assembly the mandate to provide continuity to the Cuban Revolution during a crucial, historic moment that will be defined by all that we achieve in the advance of the modernization of our social and economic model," Díaz-Canel told lawmakers in a televised address, as translated by The Associated Press. 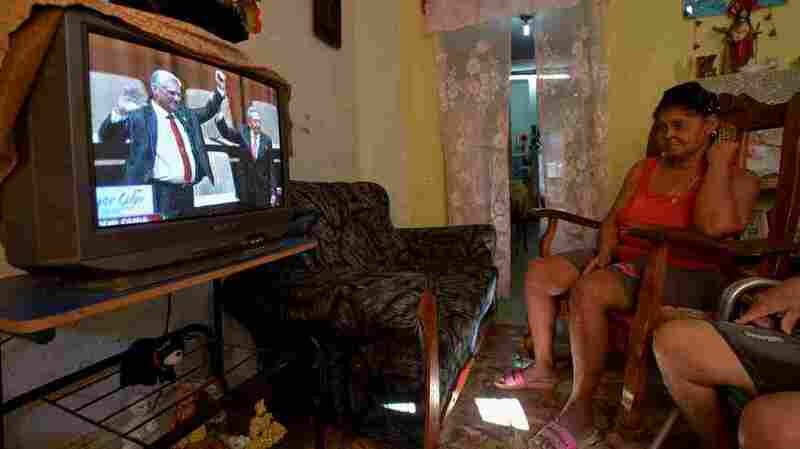 A woman watches outgoing Cuban President Raúl Castro (right) hoist the arm of his successor, Díaz-Canel, during a televised ceremony formally marking the latter's election. He outlined a vision of gradual policy evolution — and at the same time, he was careful to add that his predecessor, who has led Cuba since 2008 when his brother Fidel stepped down, would remain very much a force in the government. Raúl Castro might be passing the presidential torch, as it were, but the 86-year-old leader remains head of the military and the ruling Communist Party. Castro pledged to lead the party until 2021, at which point Díaz-Canel is expected to replace him in that position, as well. "I confirm to this assembly that Raúl Castro, as first secretary of the Communist Party, will lead the decisions about the future of the country," Díaz-Canel said, according to the AP. "Cuba needs him, providing ideas and proposals for the revolutionary cause, orienting and alerting us about any error or deficiency, teaching us, and always ready to confront imperialism." Still, beneath the promises of continuity rests an important — if symbolic — changing of the guard. At nearly three decades Castro's junior, Díaz-Canel hails from a generation that wasn't even alive when Fidel Castro led the revolution ousting military dictator Fulgencio Batista in 1959. And though he has publicly espoused party orthodoxy, Díaz-Canel has not been a cookie-cutter bureaucrat, exactly. NPR's Carrie Kahn notes that as a young man, the longtime provincial leader who became first vice president "did sport long hair, loved rock music and even backed a local LGBT-friendly cultural center." It remains unclear what his tenure in the presidency will spell for Cuba's fraught relations with its capitalist neighbor across the Straits of Florida. Under the Obama administration, it had appeared the U.S. and Cuba, long frozen in stalemate, had been headed for a thaw. The two countries re-established diplomatic relations in 2015, and Cuba even hosted Obama on a state visit not long afterward. But those newly established ties have frayed since President Trump took office, bringing a much more skeptical view of Cuba into the White House. It is unlikely to be lost on the average Cuban, and certainly not on Cuban leadership, that this transition of power is occurring almost 57 years to the day since the Bay of Pigs invasion. That disastrous attempt to overthrow Fidel Castro's then-nascent regime, which was led by Cuban exiles and supported by the CIA, ended within days and in humiliation for the would-be topplers. For now, though, history weighs less in the balance than in the present for Cubans, many of whom, Carrie reports, are a little reluctant to talk politics. "What everybody is willing to talk about, though, is the poor economy here. On average, you know, a Cuban state salary is about $30 a month. You just can't live off that here," she tells All Things Considered. "So people are hurting," she adds, "and they really want to see the economy grow." A previous version of this story incorrectly stated that Miguel Mario Díaz-Canel Bermúdez is Cuba's first president not named Castro in 59 years. In fact, others have held that title at times during the Castros' dominance.